Once you’ve pitched up on site one of the first things many people do is pop the kettle on, pop the cork on a bottle of wine or crack open a bottle of beer! 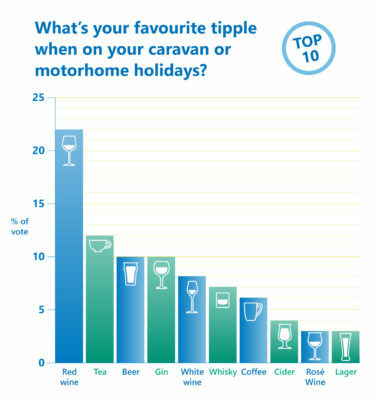 In last month’s community poll, ahead of the festive season, we asked you to vote for your favourite tipple when on your caravan or motorhome holidays. With hundreds of votes and many tipples to choose from, there was one stand out winner with almost a quarter of the votes. Top of the tipples with 22 per cent of the votes was red wine – great for caravanning as it doesn’t need to be chilled! A good old cuppa tea took second place with a 12 per cent share of the votes. And tied in joint third place, with 10 per cent, was beer and gin – not mixed together of course! White wine took fifth placing with just eight per cent of votes, followed closely behind by whisky, coffee and cider. The last two spots of our top 10 tipples were rosé wine and lager. With so many beverages to choose from, many received a small number of votes with some popular non-alcoholic drinks like fruit juice and cordial not even getting on to the leader board. There were also a number of drinks we didn’t mention but were added to the comments section by our readers. These included brandy, chestnut liquor, Buck’s Fizz, Vodka Caramel, Cava, and Kraken with coke. Understandably some found it difficult to single out a top tipple. John Punshon even said it depended on what was on offer at the supermarket! Also, the time of day was a factor when picking out your favourite drinks. Margaret Driffle likes a cup of tea first thing, then coffee and then in the evening a brandy and coke with lots of ice. Finally, Robert makes sure his ‘van is well stocked with a selection of alcoholic drinks. As a caravan and motorhome insurance specialist, one bit of related advice we can offer is to make sure those glass bottles are well secured when in transit and to make sure they’re not kept in cupboards above your glass hob covers. Spillage of red wine on soft furnishings and carpets, and cracked hob covers are common insurance claims. Poll: What’s your favourite tipple when away in your caravan or motorhome?